As you can see from the pictures below, Hayden is starting to get into more and more things. The world is his oyster and boy is he exploring! And mostly everything is experienced by first going into his mouth. The first picture is a perfect portrayal of what i've been telling you guys, anything that goes in your mouth, he wants too! Then the second picture, I have NO idea how he did this.......I came into the room to find him with half his shirt off. I'm sure it won't be the first time he'll amaze me or make me wonder, "How did he do that?" The last picture is just WAY too cute, in my eyes. I love Hardees (as most of you know) and especially Monster Burgers, which by the way, they are back for a limited time..........and Amy H. had stopped by the Hardees in Cannon Falls and dropped a monster burger off for me on Tuesday. That was my first day back to school for the semester and I came home to everyone (Dennis, Hayden AND Haylee) waiting at the top step holding Hardees just for me! A mom couldn't ask for more. Ahhh.......what little it takes to make me happy! 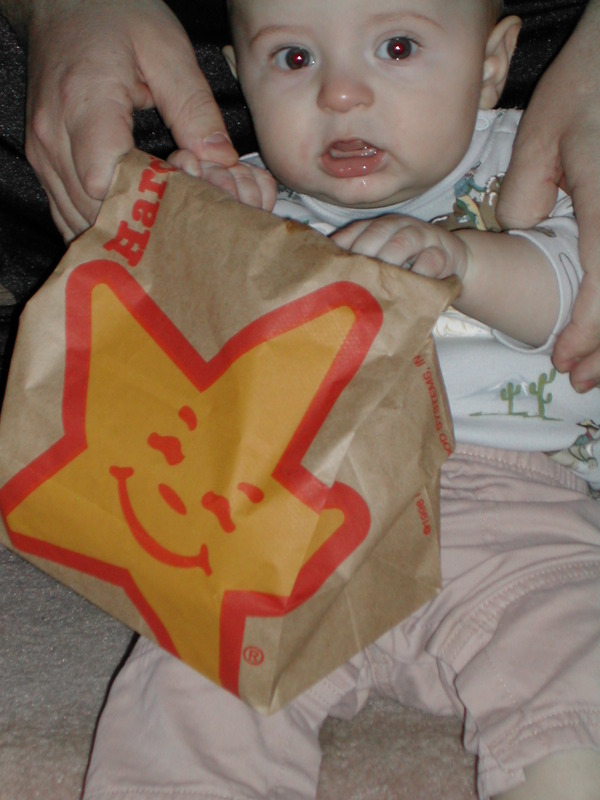 :-)~ Anyway, back to Hayden.....although, he loved licking the Hardees bag, so I think he's going to love Hardees as much as his mamma! 8-5 job. I love my days home with him. He absolutely loves to play and just cannot get enough interaction. I cherish the fact that I can be home to give that one on one time to him. Once he gets older and can start playing more and become a bit more independant it won't be so hard to have him at daycare, socializing with other kids, but right now hanging out with Mom is quite alright. We're actually going to start introducing signs to him. I've gotten my whole "Sign with Baby" package and have started reading. They say,around 8 months they'll really start getting the hang of it or be able to use their hands better, but you can start introducing signs very slowly before then. The first ones they recommend are "EAT", "MORE", and "MILK". I've shown him "EAT" a couple times, but he's been so intrigued with everything else, I'm not sure how much he's watching. :-) He'll eventually learn and they say, it helps them develop their language skills sooner. It should be very interesting. He's been rolling around much faster and changing his 'location' a lot quicker too. He has actually pulled himself up on his hands and knees too. His arms are still a little too weak to hold himself for too long. But I wouldn't be surprised if he'd be doing that more often. He definitely wants to get going, if something is just out of reach, he sure vocalizes frustration for not being able to get it. His favorite things to watch still are Haylee and his dancing Elmo. They make him just laugh and giggle. That is the most beautiful sound, hearing him giggle! He's also gotten a chuckle out of me running in place and jumping up and down (what we don't do to get a laugh! ).......he also gets the biggest kick out of anyone 'clicking' their tongue. He'll imitate it and loves it when we sing "Drop it Like it's Hot" by Snoop Dogg.........they do the clicking of the tongue in the song and sing "Snoooooooooooop"........loves it! Well we also found out, Hayden is going to have another playmate friend. My good friend Randina and her husband are expecting! And their baby might have the same birthday as Hayden. She's due August 6th. We're hoping everything goes great in her pregnancy! I am hoping this is the first in a long line of announcements of my girlfriends expecting babies. There are a few of them trying, so we're hoping to be spreading more good news! Good luck ladies, it's the best thing in the world. I can't wait to be pregnant again, but it'll probably be a while before Hayden has a little brother or sister! But, make lots of little friends for Hayden! I hope everybody got to see last week's update ok........I had some difficulties with saving my update, but I think eventually it got on the new page. We had a pretty busy week, lots of running around! I had my first full day in the hospital on Tuesday and then had classes during the day for work on Wed and Thursday, so poor Dennis had to stay up with Hayden after working his night shifts. It made for a long week for him! He's been such a champ, I can sure count on him..........what a guy! We also visited lots of people and places. On Tuesday Hayden went to a going away party for one of my co-workers, so he got to meet some more of my co-workers...........and most importantly, he got to meet a beautiful 'older' woman, named Sierra Ruechel. 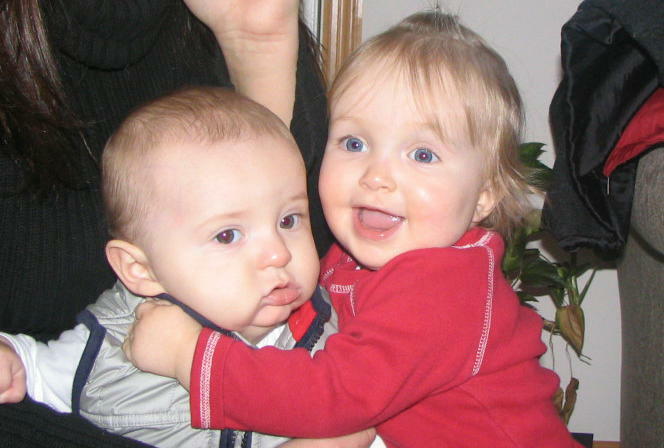 She's the daughter of one of my co-workers and as you can see from the picture below, they really liked each other! Put your mouse over the picture to see Hayden's reaction to her hugs!!!! It almost brought tears to my eyes to see how excited he got when she hugged him and was playing with him. It really made me think that he would be ready and really enjoy going to daycare...........now we just have to find one! :-) Hayden also got a 'big boy bathtub seat' this week and has really enjoyed baths a lot more! He can find his toes and toys and loves the bubbles. It's such a treat to watch him enjoy his surroundings. He played for so long the other day he got little prune toes and fingers! Check out the picture of him below playing in the tub, put your mouse over it to see his 'baby mohawk'........he's finally getting enough hair to make some crazy hairdos! Dennis bought me a new digital camera for my birthday and Hayden has taken a liking to it and I'm trying to figure out all the features, so there'll probably be a lot of fun new pictures up more often. You can see pictures from my birthday celebrations by clicking here. The funny thing though is, Hayden tends to get this "dopey" look when I get the camera out.........and normally he's a smiling kid, so a lot of his pictures don't show how smiley he really is! But those of you who get to see him often know how happy of a boy he can be! Hayden is also sitting up independantly and has gotten on his knees and scotted pretty far, without using his hands, so I'm waiting for a little 'carpet burn' spot on his nose! He's now fitting into 6-9 month clothes and I'll soon be scheduling his 6mos pictures. Still no teeth............I told my family, we're having a huge party when he finally cuts that first one...........it's been a long anticipated wait and who knows how much longer of a wait it'll be! He's starting to not just put everything in his mouth, but he's into 'BITING' it................makes nursing a little painful at times! You''ll prop him up on your shoulder to carry him and he'll bite your shouder...her arm, anything within mouth's distance. Valentine's Day is just around the corner..expect some cute 'Valentine's Day' pictures to be posted in the next couple of weeks. 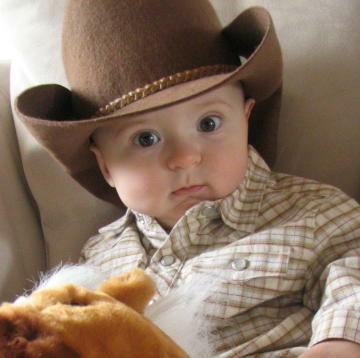 Speaking of Valentine's, that is the deadline for submitting the Cutest Baby picture...........and so far, most reponses have been for the picture of Hayden on his horse wearing his cowboy hat............an absolute favorite of mine. I'm going to try and replicate that exact picture but get him smiling...........so then it'll be perfect! I wll be sure to add it to the page if I can get a good one. I think that's about all the updating for the week............keep visiting us! From the looks of the first picture, it doesn't look as nice outside as it was. Gma came over to watch Hayden for a little while on Friday and it was so nice and warm the two went out for a walk. The air quality was a little better that day too I think......anyway, he did love to be outside and fell asleep before he got home. I can't wait for summer to get here so he can go out and play and we can go for walks. I know he'll love it! The second picture is just another demonstration on how everything must go in the mouth..........his toes too! He's still pretty flexible, even with the budda belly he's getting and the chubby thighs. The new big thing that happened this weekend is, he's 'crawling'!!!! I'm going to call it crawling cuz I'm not really sure what else to call it, it's more of an elaborate 'scoot' forward. What he'll do is, lay on his side and kick his legs up..........as he brings them down he turns back onto his belly and uses the 'force' to push himself forward. He gets pretty far each time he does it and has really figured this out. It's quite comical. I don't know how Haylee will feel once he can start chasing after her! He is a very determined kid, so I'm sure it won't be long before he's up on his hands and knees rocking and moving that way. The last picture is of him playing some more. It seems every week he has a new interest in a different toy.........or a different interest on a different part of the same toy. 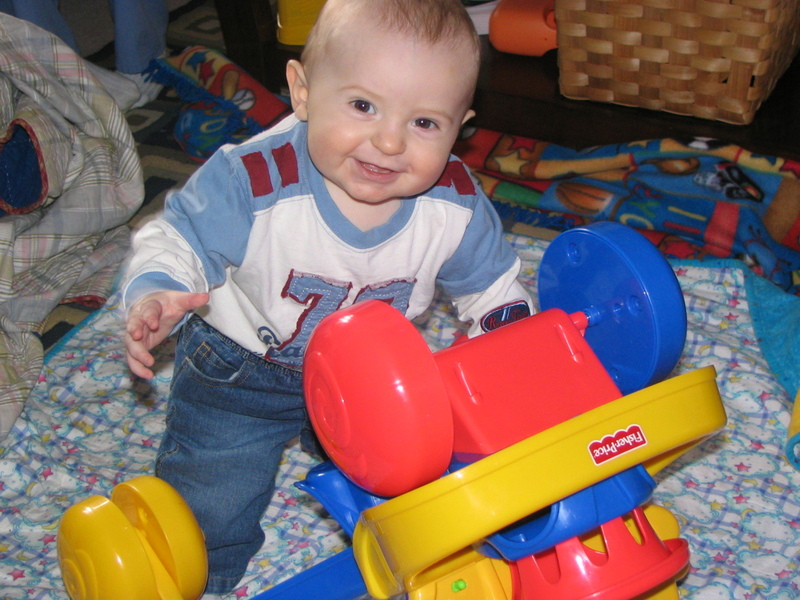 He's learning how to move all the different levers of things and the different sounds they'll make and likes to see his hands make things move. He also is playing with pretty simple toys and keeping occupied, like his shape sorter bucket he got for Xmas. He's also sitting up independantly pretty steady. We just put the boppy around him to soften any tumbles he might have. I also have posted some other "cowboy/horse" pictures that I took more recently. There not one particular one that jumps out because he's not really smiling too big in any, but I almost wonder if they're cuter than the original. Everyone seems to like that one the best, so I'm sure I'll be sending in one of those. What do you think? More big news..........I FINALLY have our wedding pictures posted! It's about time huh? And, before our one year anniversary. I was really worried i'd never get them up. But, I"m also going to be adding a couple of new pages I think. I have Hayden's birth and hospital pictures scanned, so I should be able to add more pictures to the site, plus his delivery.....(don't worry, there's nothing gory!). I'm not making any promises on when they'll be up, hopefully before he's one! Well going to run, have to get off to bed after having worked all weekend. The boys had a great time together all weekend, watched the Goonies and a little football on Sunday. Male bonding, don't ask any questions :-)~!! 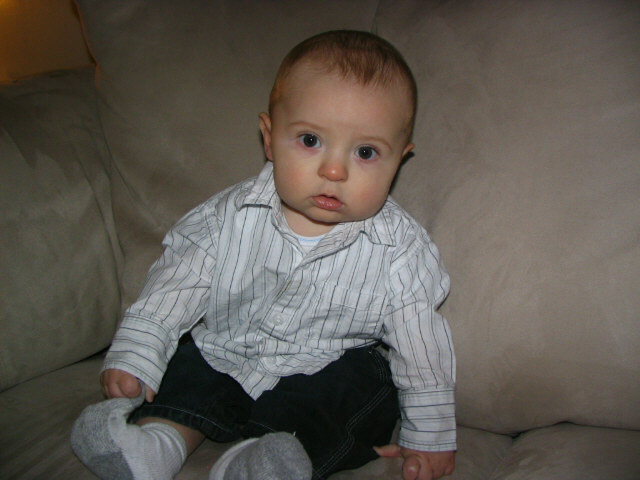 Click here for more information on when and how to vote for Hayden in the Cutest Baby of 2004 Contest! Hayden turned officially 6 months this past week, and what a big boy he is! I weighed him on our scale and it read that he was 18.5 pounds. I hear so many people say, 'my kid is that much at a year old! '........yes, yes, he's a chunk! :-) But he's like his mamma, fat and happy! He has been so pleasant and I think I know why. I've read that they have done some studies and concluded that babies whose mother ate a lot of chocolate during their pregnancy have happier babies......I think that's why he's so good! :-) And believe me, I have no objections to do the same thing with my next pregnancy, all for the sake of having a happy child (wink, wink!). He's so happy that he'll just SCREAM or maybe squeal is a better word and stick his arms straight out and drop his jaw with mouth wide open and then shake his arms! It's quite a sight...........he'll go on squealing for about half an hour. And now, we'll make a noise at him, a scream or grunt, and he'll try to make the same sound back to you. It's quite amusing, it's almost a conversation with him. That's about all I can think of right now..............as for other info..........don't forget about the March of Dimes walk..........email me and let me know if you can do it! We're getting a good number of people already! Friday Dennis had the day off and we went for a little road trip. First we went to Red Wing and got some HARDEES! and then down to Lake City to get our taxes done. Hayden did great, he sat very patiently. Then we went back home, went shopping and then went out to eat to TGI Fridays. A whole bunch of work friends were out with their spouses/significant others and it was nice to have supper with them. The two of us together haven't been able to hang out with adults in a while. Friday was a little more trying for Hayden............he was a little bit of a grump from time to time, I don't know if it was a combo of his teeth (still none yet), not getting a big nap in, and all the activity..........but he definitely slept well when he got home. Then Saturday Gma & Gpa Reckward came up to see him! It'd been since Christmas and boy was he excited. He had so many things to show off to them. Gma Judy even got to rock him asleep and she has the special Grandma touch, and he fell asleep pretty quickly! Gma & Gpa Reckward are going to babysit him in a couple of weeks, I know they're going to have a great time! 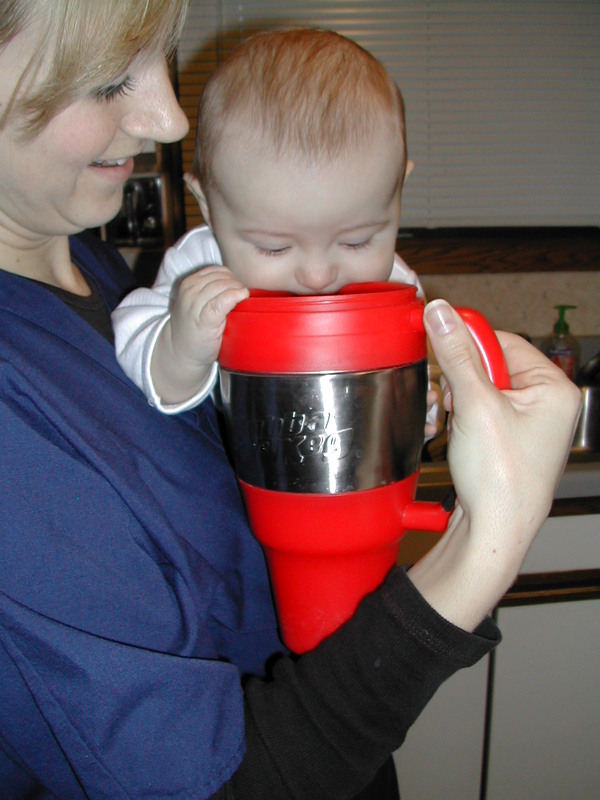 One more reminder, on Friday February 25th the Post Bulletin is having their special insert, "Cutest Baby of 2004".....I will add the voting information on our special "Cutest Baby" webpage once I have the details............BE SURE TO VOTE!!!! Where has the month gone? It just seems like Hayden turned 6 months and in about a week, he'll be 7 months already!!! The time is going by so fast, probably because we're having SO much fun! This kid is just developing by leaps and bounds. Just yesterday he got up on his hands and knees and is crawling!!! It's definitely an organized and intentional mode of transportation for Hayden. He starts on his hands and knees, then he goes into a push up position, up on his toes.......brings the knees in and pushes, then he drops on belly, teeters and back up on his knees. It's so funny! It's just amazing to see him move like that. It won't be long before he's walking too I've had a lot of people tell me. 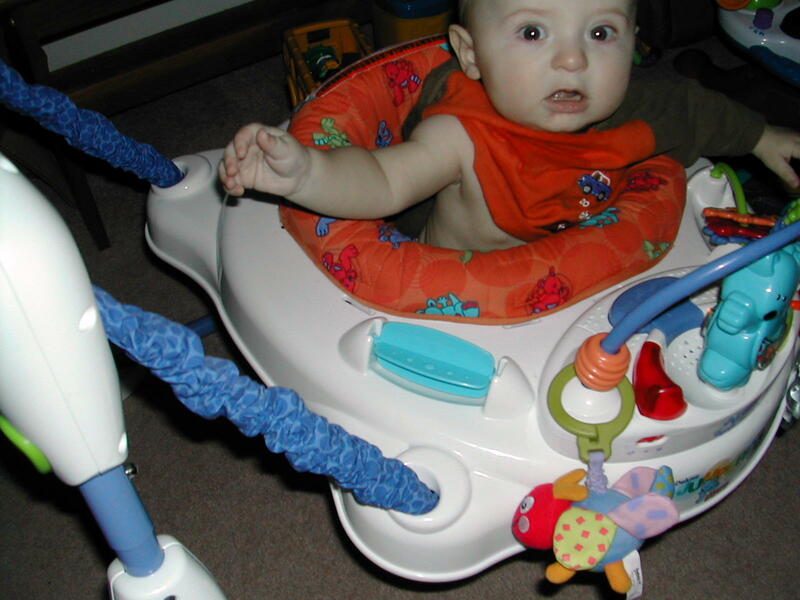 He stood behind his little walker thing yesterday and took off...how scary! Another crazy thing he did this week was, he said 'da da' while him and Dennis were playing. It was probably just coincidence and not an intentional thing to say, but we both got so excited, I almost started crying (with happiness). Dennis was so excited to, he yelled, 'did you hear that? He said da-da'.....the smile on his face was huge! He's had a big week. He stayed at Grandma & Grandpa's a lot this week...........we both had to work a lot of night shifts on the same night. Dennis is now done with his night shifts and just started his straight day position. I took the weekend off to go on a scrapbooking retreat and so Hayden stayed at Amy & MIlt's house on Friday night too. Lots of slumber parties! Of course, he behaved like an angel for everyone. Dennis even took him on his own down to Decorah on Saturday. The boys did just fine. I was a little worried, they have never been on an adventure on their own before. Still no teeth for Hayden, they're sure brewing under there though, you can feel the little bumps and edges.........I'm not going to say it'll be soon, because I've been saying that for MONTHS! He's eating cereal about everyday too..........he finished up a box of rice cereal and now we're starting Oatmeal, and he seems to like that even more. It even smells better, so I'm sure it takes better too! We'll probably start baby food in a few weeks. I'm a little hesitant though.................and if you were around Hayden for even an hour, you'll understand why. This is the GASSIEST kid I have ever met. Swear to God, that last few days, he farts at least 4 times an hour!!!!!!!!!! And they SMELL!!!!!!!!! I don't understand, he only has breastmilk and cereal in his diet. You would swear he has a diaper full with how much rumbling goes on in there. Unbelieveable.............I'm in for a treat when he gets older..........and starts eating regular food! This will be the last time I'm talking about this though.............Voting for the Cutest Baby Contest is going on RIGHT NOW!!! If you haven't done so already, you better do it now! March 2nd is the last day to vote, click here for more details on how to vote! I don't know if you got the paper, but there was another little boy wearing the exact same outfit as Hayden! I hope he still gets lots of votes though!!! Results of the contest will be in the weekends (March 5th) paper. Keep your fingers crossed! Be sure to tell everyone to vote too! Well, got to run, Hayden is calling! Have a GREAT week! Can you believe it's Thursday and I'm JUST getting my updates made now? Better late than never I say. I've decided that I'm very glad that I am doing these weekly 'journals' for Hayden's infancy.......I"m going to print off each weeks entry and put it into a scrapbook for him to read when he gets older. Kind of his own personal story........along with his scrapbook I'm making with his pictures. He probably won't appreciate the time and effort put into it, but I most definitely will..........because already, I'm starting to forget things. Like for instance, what I should be putting in for this past week's entry! He still has some of his filthy habits, for instance, putting everything in his mouth, that hasn't changed at all! This one picture below, put your mouse over it too...........will clearly demonstrate it, again. It makes feeding him his cereal a little tricky...........he likes to put his pj feet or socks in his mouth when he face if full of cereal! The baby contest..........I'm very sad to say that 'technically' Hayden did not win the contest............but in all of our eyes and hearts, we KNOW he is the Cutest Baby of 2004! Hayden got to stay at Grandma & Grandpa Jim & Judy's this Saturday. He had a BLAST! He did not want to come home and Gpa Jim didn't want him to go either. It sounds like he was not put down the entire time he was there. They thought he may have said "Mama" while he was there! Friday, Hayden, Grandma Deden and I went to Medford to go shopping............he did SO good! I was a little worried, he had a couple really bad episodes the day before of throwing a temper tantrum. I thought he either had to poop or his teeth were bothering him. It's so hard to tell............cause the kid farts ALL THE TIME!............and you know that can't feel good! I can't really seem to remember what else went on last week. I just k now it's been pretty chaotic even though we're starting to get on schedule now...........and Dennis is back to work on his straight day shifts too. So, we're going to be having Ashley come and watch Hayden in the morning for the short time my and Dennis' shifts overlap. Once she's done with school, she's going to watch Hayden half days for us while I sleep after my night shift. So, that'll work out great for everyone! Well I'm going to run.................I have so much to add for next week, especially over half the next week has passed before I made the update. WEEK 31: March 14th Happy Birthday Grandpa Deden!!!! And Happy St Patty's Day! HE FINALLY GOT A TOOTH!!!!! 20 weeks later and he finally got one.......................at this rate he won't have his teeth until he's 20!!! I had been thinking a long, long time ago that it would finally come and now it did. He didn't do too bad either, he hasn't been crabby at all. He's actually been SO smiley this past week. Probably because he's happy it's finally come too! His tongue is constantly running over it and he doesn't let you look at it at all. I'd love to take a picture of it, proof that it finally came, but he won't open his mouth for me. We're very excited for it to have finally happened. The nice thing now is everytime I pull the camera out he smiles. Before he'd make this really dopey look and not often smile. Now he knows exactly what to do............so, now I have all these cute pictures of him smiling that I have to find a place for. So, I'll be adding a bunch to Hayden's favorite pictures...........I haven't posted any to that page in a while, so check it out later. not totally "getting it" yet. WEEK 32: HAPPY EASTER ! By the pictures this week, it may look like some really, really bad parenting. WARNING: No children were harmed in the snapping of these pictures! :-)~ This little boy had gotten a wild streak in him all of a sudden. The scary part is, he's been pretty sick all week long with his first official cold, so I can't imagine what he's going to be like in full health! The biggest surprise is when we walked in to find him standing alone in his crib on Sunday morning. Put your mouse/cursor over the picture to see how his crib looked...........he had pulled his monitor, changing pad and a shirt into the crib with him. Dennis just lowered his crib a few weekends ago, I think he's going to have to lower it again, otherwise we might be waking up to a loud crash some morning! We might have to do some rearranging as well, there's a large basket of lotions, soaps, washclothes, etc on his changing table beside his crib, we might find all of that in his crib sometime too! What a little stinker! No, but it does not end there.........now he's chewing on Haylee's bones! YUCK, I know.........poor Haylee gets no rest.......he's starting to crawl over to her bed and now stealing her toys, poor girl! She still doesn't stay too close, especially when he's reaching out for her ears. The last picture is Hayden sucking on Dennis' piece of banana Laffy Taffy...........his one little tooth was digging into it and he was drooling like mad..........he loved it!!! We don't make a habit of giving him candy...............to be honest with you, he's just starting to eat veggies. I started feeding him peas on Monday. That was his first experience with baby food and he seemed to really like it. I decided to start with veggies, I was worried he'd not like the veggies if I introduced them after fruits. So, he's had peas a few days and then Sunday he tried carrots for the first time. Maybe next week we'll go to fruits. It won't be long and he'll be eating soft food a the table with us.......how weird will that be? The sad thing this week was Hayden's miserable cold, which we all have now! He was pretty miserable............he was up most the night Monday and Tuesday, finally getting a bit more sleep Wednesday, and stopped spiking temps on Thursday. He even threw up a few times Saturday, which freaked me out a little bit. He's pretty much just has the running nose now and the lose cough now, so he's feeling a bit better..........still a little grumpy though, especially if he isn't getting something he wants...which is everything! :-) I don't blame him for being grumpy, I've been a tad grumpy myself (tired, sick, stress)...........but as long as it's not permanent (the grumpiness) we're fine! :-) We can't complain though, he's an extremely lovely child and we're so lucky to have him. Who couldn't love him? Remember a couple weeks back me telling you about his crazy happy look? Where he'll drop his jaw, stick is arms straight out and clinch his fists and shake.........well Megan got a great picture of him doing it, click here to see the picture! So Hayden had another great and eventful week. Dennis taught him how to wave bye-bye and he does it quite a bit now, (makes a fist and opens it). It's great to see him using his hands, so hopefully now some signs that we've been using might be shown back! He literally is a sponge and is just soaking up all this information, it's amazing! He's also walking with his walker independantly! Earlier in the week he was slowly walking and then just a couple of days later, he was cruising pretty good. It's SO funny to see him walking so well, he just looks too little to be doing that! :-) He's also pulling himself up on EVERYTHING, the coffee table, the speaker in the living room, the gate at the top of the stairs, everything! It's surprising to see howmuch he has started doing in just the last couple of weeks, he's growing SO fast. He's also started baby food last week. We actually started off with veggies, peas to be exact. I wanted to make sure he'd eat them, so I was nervous if we started with fruti he might not like the veggies that well afterward. And so far, he has done AWESOME at eating them! He might even finish off a a little jar himself in one sitting. He keeps it in his mouth real well, but what worries me is what's coming out now that he's eating solids! Let's just say , he's definitely his father's son in that department! So, Hayden has now had peas, carrots and sweet potatoes. And, at Easter he got to try just a little taste of cheesecake and ice cream..........what the grandparents have let him try when I'm not around, I don't know ;-)~ Dennis is just as bad, he gave him a teeny little pinch of a cookie! I'm trying to develop good eating habits in this kiddo, especially since Dennis and I don't have the best ones. I think we'll start fruit next week. Oh, Easter.............it was a great time. We (me, Dennis, Hayden & Haylee) all went down to Decorah on Saturday evening. WE got some Mabe's and Happy Joe's pizza (a little taste test of the best pizza in Decorah) and Gma & Gpa Reckward watched Hayden while Dennis, Chad and I went to Million Dollar Baby. Let me just say this once, if you haven't seen that movie, YOU MUST GO SEE IT! It isn't what you would expect and it's absolutely touching, you will seriously be moved. The beginning is a little slow and I couldn't really see what made it to where it won so many awards, but just tough it out....it's very good. So, back onto Easter. So Sunday morning we went to Jim & Judy's church for their Easter service. Hayden was just a little angel! He went up and had communion with us and just did wondeful! This is where we are planning on getting Hayden baptized, and hopefully we'll be doing it in the next couple of months, now that the weather is nice. We had wanted to do it sooner, but we had the wedding and then the winter weather. So we thought this Spring would be perfect as we wouldn't have to worry about blizzards (hopefully!) Dennis' brother Chad and our friend Stephanie Miller are going to be the godparents.......I know they're both very happy to be his sponsors. Then, Sunday afternoon, we went back to Rochester and had Easter with my side of the family. Hayden really enjoyed the kids on their Easter egg hunt. Looking back at the pictures I felt bad that I hadn't brought his Easter basket and had little plastic eggs for him to play with. He really loved watching all the activity and seeing everyone! Well, that's about all for now.......hope everyone had a great Easter. More updates and pictures next week! Click here to see our Easter pictures. Another busy week for all of us, especially in keeping up with the ever growing Hayden James! Boy, can he move fast.......he is into literally everything..........Haylee's dog dishes (thankfully Haylee usually eats all her food once we give her her food in the morning), the mail, the lazy susan, the bedrooms, the bathroom, etc. He's quite a boy, likes to shake and rattle anything he can get his hands on. Hayden and his friend Alex got to play last week as well. Alex is 18 months and Hayden thought he was quite a hot shot playing with a 'big' boy. The two got a long good and Hayden didn't mind sharing his toys with Alex. Hayden is missing his Grandma & Grandpa and Auntie Ash though...........they're all in Jamaica this week! But I think although they're having a lot of fun, I'm sure they're missing him just as much. They'll have been gone a week, but will be home very soon. Another exciting thing Hayden got to do this weekend was go to Home Depot with Dennis.................click here to see why we went and the fun things the boys got to do! I think that's about all the updating I can think of.................keeping busy and the boy is growing! As you can see from the pictures below, we're having a lot of fun at our house. Hayden's turning into a little boy now and not such a baby boy anymore. The kid loves to play more than life itself..........he's a maniac!! :-)~ Although he still loves his Baby Einstein which is the only way we can get him to sit still anymore. He's taking less bottles and eating more baby food...........we're trying for three times a day, but it doesn't always work out with our busy schedules. He loves going on walks and will even hold Haylee's leash and just giggle at her. I still think she's his favorite!........even more than mom and dad.........we don't quite get the laughs she does. He stands up to everything and is starting to reach from the coffee table to the couch and transfer over. Pretty brave boy on our hands. As you can see from the homepage picture, my parents and sister are now back from Jamaica.............and boy did they get some cute stuff for Hayden! Click here in case you missed the funny picture I took! They sure did miss Mr Hayden. That's about all that I can remember for this weeks entry..............will be starting a new page for next few weeks! !